I deliberately chose a Metal album after a Post Metal album. 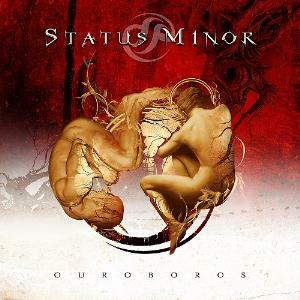 Like SISARE, STATUS MINOR hails from my country Finland, and this is their second album. I must point out that I'm not a listener of Metal / Heavy, but I'm doing my best to evaluate this against my very thin knowledge and interest for the genre(s). Quite certainly this represents the more melodic, more accessible and more likable Metal area to me. First, the vocals of Markku Kuikka are not awful growl but powerful and masculine in a respectable way. And second, the sound is meaty and intensive without getting too aggressive. Keyaboards sometimes get almost buried in the sound wall in the heaviest tracks such as 'Glass Wall', but then enters a keyboard intro of 'Like a Dream', just in perfect time. That beautiful, emotional Metal ballad features the duet vocals of Anna Murphy (whoever she is). Brief 'Confidence and Trust' is completely piano-oriented, and Anna Murphy sings all the vocals. Wow, these things are very nice surprises to my ears, on a Metal album! 'Stain' marks the return to the more typical heaviness, but the bright keys are audible too. That and 'Smile' fail to impress me, but for a Metal fan they probably work just fine. 'Flowers die' starts with a delicate acoustic guitar and is a relatively mellow Heavy Rock semi-ballad, easy to enjoy. It also features a good electric guitar solo. The final track 'Sail away' is nearly 11 minutes and right from the start it has a sense of a prog epic, containing various sections and orientating more towards synths than Metal-style guitars. And again a nice surprise to hear the voice of Anna Murphy, though quite briefly. Now, the difficult task of rating, from my anti-Metal background. Naturally I'm not saying with these three stars that I'd enjoy this as much as three-star albums on my fave genres, but this clearly is a good product in the genre, and the kind of a Metal album that gradually succeeds to increase my appetite... Make it 3½ stars!